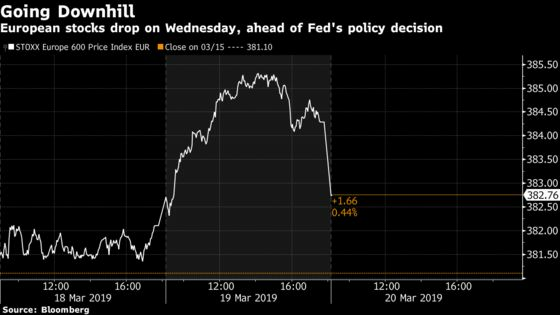 European shares opened lower on Wednesday, ahead of the Federal Reserve’s policy decision. Brexit also remains in focus with nine days left until the U.K. is due to exit the European Union and uncertainty over how long it could be delayed. “Today all eyes are on Fed, which was one of the main culprits for the rally with its complete change of stance from tightening to promising accommodation in just a couple of months round the new year,” said Lippo Suominen, chief strategist at Finnish asset manager FIM. The policy decision is expected later on Wednesday. The Stoxx Europe 600 Index fell 0.4 percent, with basic resources the worst sector performer. With new U.S.-China trade talk concerns floating to the surface, carmakers and parts suppliers were again under scrutiny. Germany’s Bayer AG lost the first phase of a jury trial in the U.S. over claims its Roundup weed killer causes cancer, and U.K. satellite firm Inmarsat Plc received a $3.3 billion private equity-led bid. Investors are wondering what to do after three months of equity gains. From now on, the rally must be based on hopes of a clear economic pick-up later this year as growth in the first quarter will be weak, said Suominen.